These configuration options are described in the following sections. If auto refresh is disabled, the Dashboard will only refresh itself when you click the Run button. Note, too that you can set separate refresh intervals for each item on the Dashboard. See the topic Dashboard Element Name for more information. Specifies a time zone for the dashboard. 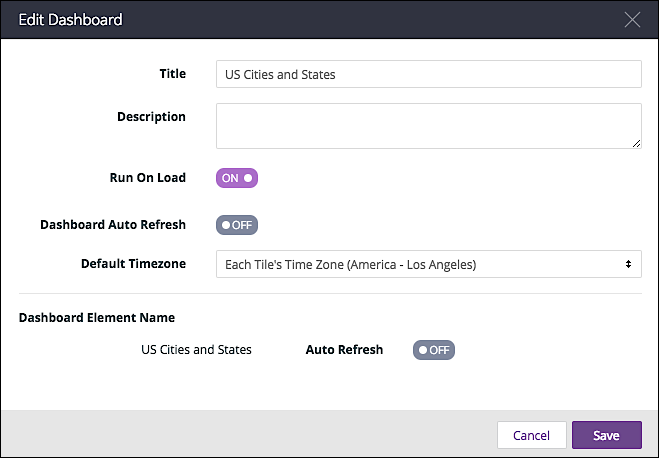 (By default, dashboards use the same time zone as the user who creates the dashboard.) 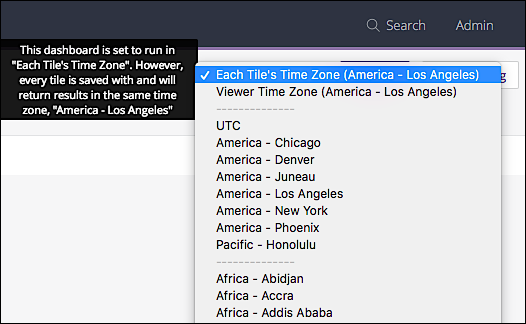 Be forewarned that changing time zones can potentially affect date-based data: for example, an event that occurred at 11 PM on March 1st in the Pacific time zone actually occurred on March 2nd in the Eastern time zone.